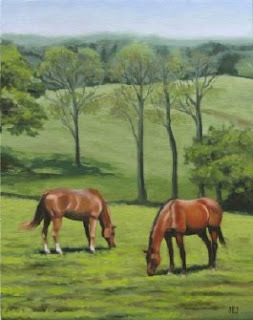 Good news in the mail last week....I'm happy to have been juried into the New Jersey Equine Artists Association's 2008 show. This show is held every two years at the Somerset Art Association in Bedminster, N.J. Unfortunately I won't be able to make it up there for the opening. 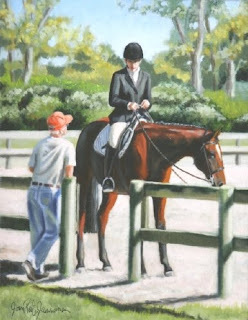 The show has a very good reputation and I know that there will be a lot of wonderful work to see for all of you horse lovers out there. It runs from Sept. 14th through October 25th. 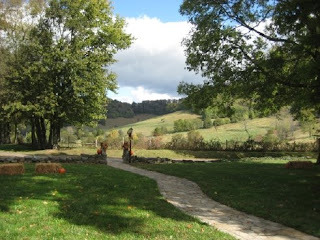 Here is my entry "View from Virginia Tech Barn"
From time to time I'd like to post some of my smaller works that I do not post on my main website. These may be studies for larger paintings that work well on their own. The galleries that carry my work also like to have some small pieces available for their buyers. Last year I found that fox subjects really resonated with buyers. I also found out that they are a blast to paint. I mean nature gave them quite a ready to wear outfit! The black , white, grey and rusty red colors are a painting waiting to happen. So, here are two examples of some 5 x 7's. We have a fox that we call "Rusty" who lives and roams around where we live and occasionally I'll get some photos of him for reference. They are certainly fast little buggers and I only see him when the light is not so good, early morning or dusk. They are quick and very alert. 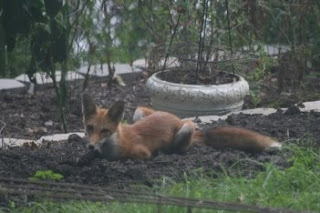 I found that sneaking up on a fox is not easy! 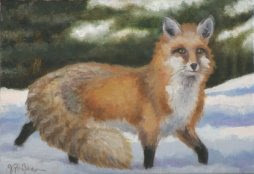 Anyway, these particular paintings are already sold but I have some fox paintings in progress at the moment for shows and galleries in the fall. All my time is dedicated to a fox hunt commission right now and I'll post that on my main site soon. I've posted the original panel that arrived in the mail to me back in May. I took one look at it and couldn't imagine anything else but a big log jump. That's probably because my friend and I just got back from the Rolex 3 day event and I guess I still had the images of those monster sized hurdles on my mind ! The colors were not in my usual pallete for sure, so it was an adventure to slather on all that purple and electric green and blue! 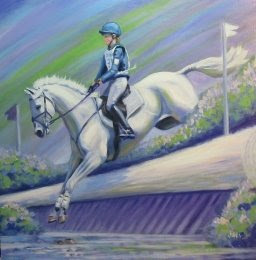 Can't wait to see the final mural image after it's unveiled at Spruce Meadows in Canada in September. 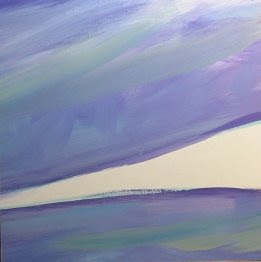 Welcome to my blog and I hope you'll visit from time to time to see what's going on at Lakehill Studio. I'll be updating with artwork and news that can act as an embellishment of my Lakehill studio website. Here you'll get a little more information about what's going on with me and what's going on in my studio. 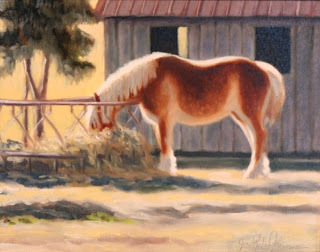 That may be updates on small works or works in progress, painting tips and my adventures in the world of art and horses. I may venture outside that world occasionally....we'll see about that !